How can the world of animal agriculture brace itself against a rising tide of activist attacks? One critical way is by better understanding the dynamics involved in the core messages these groups use time and again to drive a wedge between livestock industries and consumers, says Dr. Wes Jamison, a leading researcher and thinker on interest group activism. 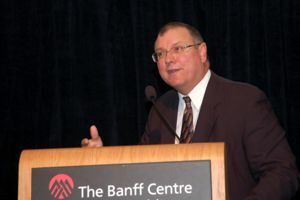 Jamison, an associate professor of communication at Palm Beach Atlantic University, unveiled his findings and theories on these dynamics at the 2013 Banff Pork Seminar. He observed that while the strategies of animal rights and welfare groups have evolved, their messaging has remained remarkably constant and holds the key to counter-strategies that can strengthen the position of livestock industries in the ongoing PR battle for the hearts and minds of consumers. "We in agriculture have traditionally thought, we just need to tell our story better," says Jamison. "Our challenge is more sophisticated than that. We need to understand the influence that activist messages are having. We need to understand what our consumers really think. Then we need to frame our message more aggressively. We need to start playing offense and not just defense." His process is based on putting activist messages under the microscope - using a combination of his own perspective as a leading academic on this issue along with a wealth of focus group and content analysis research. Here are seven keys to recognize based on some of the main observations Jamison shared with pork producers and other industry players at the Seminar. 1. Activists operate on divide and conquer. Activist messages typically focus on three things, says Jamison. First, they identify differences in the ways target consumers perceive and think about animals. Second, they seek to amplify to these consumers the "cognitive dissonance" or feeling of discomfort that results from holding two conflicting beliefs. For example, many consumers like animals and also like to eat meat from these animals. Third, the messages push consumers toward actions that promise to reduce this uncomfortable feeling of conflict. "Animal protection activists have long attacked confinement pork production as cruel and inhumane," says Jamison. "Yet consumption of pork remains a staple of many consumer diets. So, how do these animal rights and welfare groups confront this reality? By creating division and conflict in the mind of the consumer." 2. They repeat what works. It's a time tested approach that hasn't changed for many years, he says. "The specific campaigns and strategies have evolved. But one element of these has remained remarkably consistent - their messages." 3. Agriculture can 'flip the script.' The reliance on this same messaging approach however, leaves activist groups tremendously vulnerable to any counter-messages that can overpower the cognitive dissonance fog. The activist messages have not been defeated strongly enough yet to provide livestock industries with a clear victory, but that's an opportunity to focus on now. Jamison, for one, believes the task of winning the argument with the vast majority of consumers is easier for the pro-animal agriculture side. "Meat eating is a habituated behavior among consumers," he explains," and habits are hard to break. Activists have a tough challenge because they seek to change consumer behavior, while animal agriculture proponents must only provide 'permission' for consumers to help them avoid being conflicted about it and continue their meat consumption." 4. Easier today for consumers to be conflicted and separated from reality. That's not to say times aren't getting easier for activists to make inroads – in fact, that's exactly what's happening, says Jamison. People today treat and view their pets more like people and Hollywood is one of many influences reinforcing this perception. "There's no doubt many modern consumers in post-industrial, urban and suburban service-oriented economies like Canada live in a state of incongruence regarding their experience with, understanding of, and perceptions related to animals," says Jamison. "Animals in this context are viewed as individuals who are worthy of intense emotional attachment. They are still tools intended for use for humans, but their uses are increasingly viewed as non-consumptive." How do you reconcile that many of these same consumers eat meat regularly? It's simple, says Jamison. Many have little or no understanding of modern livestock production. The key is not to leave it to the activists to be the ones to educate them, he says. "Take control with your own messages." 5. The guilt-trip battle. Opponents hope that by pointing out consumer hypocrisy those targeted by the messages will change or cope with their discomfort by forgoing meat in some capacity, says Jamison. "For example, this usually means by purchasing "humane" pork or by giving votes, support or money to help the animals in question. In this way, advocates have mimicked the classic strategy of all cause-based marketing; create a sense of guilt in message targets, then position yourself and your cause as a way for the targeted consumers to work off their guilt through support of your organization and cause, thereby healing themselves of the discomfort that results from loving animals and eating them too." 6. The best response: Permission. Livestock industries need to help consumers avoid being put on this guilt trip, says Jamison. The best way to do that is to give them "permission" to keep eating meat. The messaging may not be as polished or attractive, but it can be very effective, he says, by speaking to the consumer in common sense terms. 7. Play the cards right. "In other words, the cards are stacked in favor of the meat industry," says Jamison. "We just need to play our hand more effectively, starting with our messages. In the case of the pork industry, if this is done properly and persuasively, consumers will continue eating pork and will be resistant to opponent messages that seek to amplify their guilt."